Thomas was involved in a photo shoot with Tyler Shields yesterday for Love Is Louder, a campaign led by actress Brittany Snow and MTV to help young people find support, information and help with issues including depression, abuse and eating disorders. The movement was inspired by recent suicides in America and is a great cause. Thomas’s former on-screen girlfriend, Terminator: The Sarah Connor Chronicles star Leven Rambin (Riley) posted this image of herself and Thomas on twitter, along with another behind the scenes photo of Thomas with Caprica’s Alessandra Torressani. This is something that is close to my own heart as a Psychology undergrad and it’s great to see celebrities using their influence for good! If you’re experiencing issues yourself or want to find out more about the campaign, visit the site. 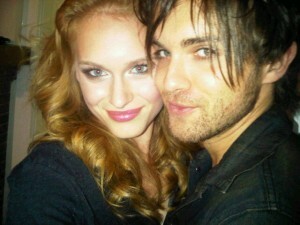 Also, visit Leven Rambin’s twitter for the super cute reunion images!